Sometimes you don’t feel 100% creative and you need a little boost. You might be in the middle of a creative block and need a little inspiration to get your creative motivation back. Today I’m sharing Part 1 of a new free mini eCourse to help inspire you and get you started toward creativity again. Part 1 is a creative activity to inspire you and boost your creativity. Part 2 is creating an art journal page. Don’t worry if you haven’t done this before, I’ll suggest ideas for your art journal – even if you don’t feel like an artist. Even though I’ll be sharing my pages, your art journal is just for you and you don’t have to share your pages with anyone. 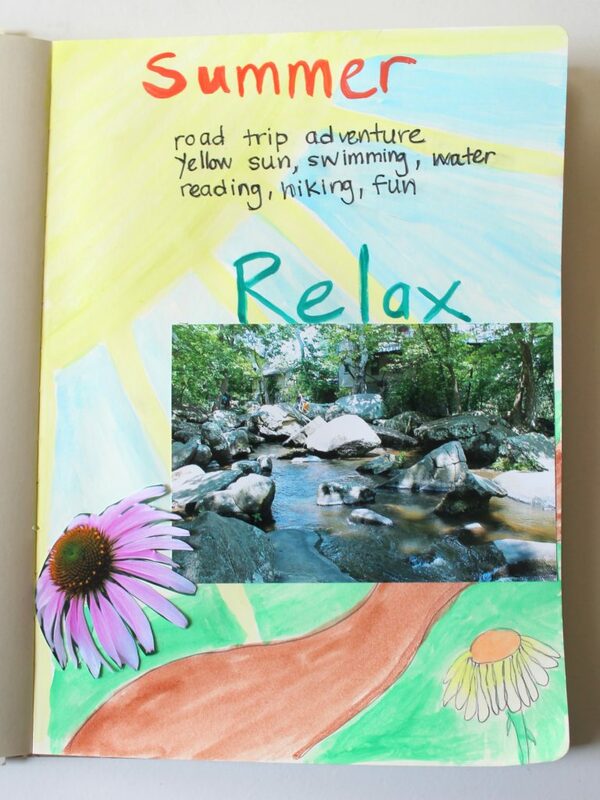 In Part 3 we’ll pull out themes and ideas from your art journal page. In Part 4 we’ll sketch our jewelry ideas. Don’t worry if you don’t think you can sketch or draw. Part 5 is a jewelry tutorial. In this mini course I hope that you’ll be inspired to come up with your own unique ideas with your own personal style. If you do, I hope you’ll make your own piece. 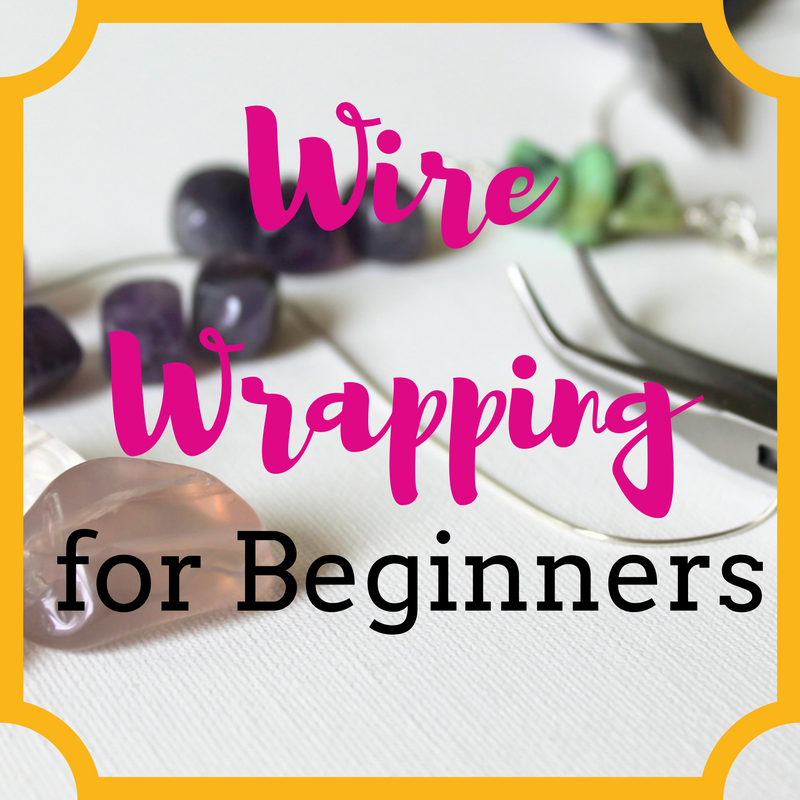 However, if you’re not sure, I have a fun, customizable jewelry tutorial for you using materials you likely already have on hand. As I said, I’ll share Part 1 here today. To get the remaining lessons, Parts 2-5, just sign up below and I’ll send you the link to enroll in the mini course for free! This mini course will give you a taste of my full eCourse, Inspired eCourse. 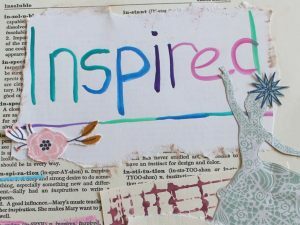 Inspired eCourse is a creativity/art journal/jewelry making course. If you like this mini course, you’ll love Inspired eCourse. You can check out the full Inspired eCourse here: Inspired eCourse. Part 1 is a creativity boosting exercise. The exercise is clean your workspace. By workspace I mean anywhere you work, whether you have a full studio, a drawer stashed with beads or anything in between. #1 You will get your mind off of creativity. This will actually help you come up with ideas. My very best ideas happen when I’m doing something else. Have you ever noticed you get ideas in the shower or when you’re doing mindless chores around the house? #2 You will actually see and touch your supplies. You might find things you forgot about or lost and get ideas of what to do with those supplies. #3 Have a clean space makes you want to dive back into a project. Sometimes it’s our tendency to want to “come up with ideas” or really push ourselves when we have creative blocks. Instead I find it helpful to do something — almost anything — else. For instance, cleaning your workspace, taking a shower, cleaning your house, doing the dishes, basically doing something that takes your mind off creativity, but something you don’t have to think about too hard. Maybe reading a fun novel or magazine would work for you. Do you remember that feeling when you’re in the bead store or online shopping and you find a great bead, clasp, etc. that you can’t wait to use? Sometimes you don’t use it right away. Then life calls and you’ve moved on. The beads get stashed on your worktable or in a box or wherever and you forget about them. Sometimes you have a few beautiful leftover beads from a project that have been tossed aside or forgotten. When you organize your supplies, you will see them again. It’s like when you got them the first time! Now you’re excited to use them again. I find this to be the case even with leftover beads from other projects. I’ll be like, “Yay! I still have a few of these beads!” And start coming up with an idea. Even if you have very little time to do a whole big reorganization, you can set a timer for 15 or 20 minutes and see how far you get. Putting away beads leftover from a project. Just picking out the scrap wire to recycle. Just picking out any trash that accumulated. As you can see, even if you don’t have hours to devote, you can just set a timer for 5 minutes and take one step. Even just 5 minutes can really get your creativity percolating. Also, you may find things you want to let go of. You can donate this items to a charity thrift store or someone who would love them. I go through and purge my supplies every so often and I love the feeling of knowing I love everything I have left. So dive in and clean up your workspace. When you find some beads that you’re really inspired by as you go along, go ahead and put them to the side for a jewelry project. I like to collect beads I want to use next in a pretty bowl or on a tray. To continue with the FREE Inspired Mini Course, sign up below. You’ll receive an email immediately with access to enroll for free to get the remaining lessons. Plus you’ll get some extra emails with helpful inspiration to guide you on your journey. 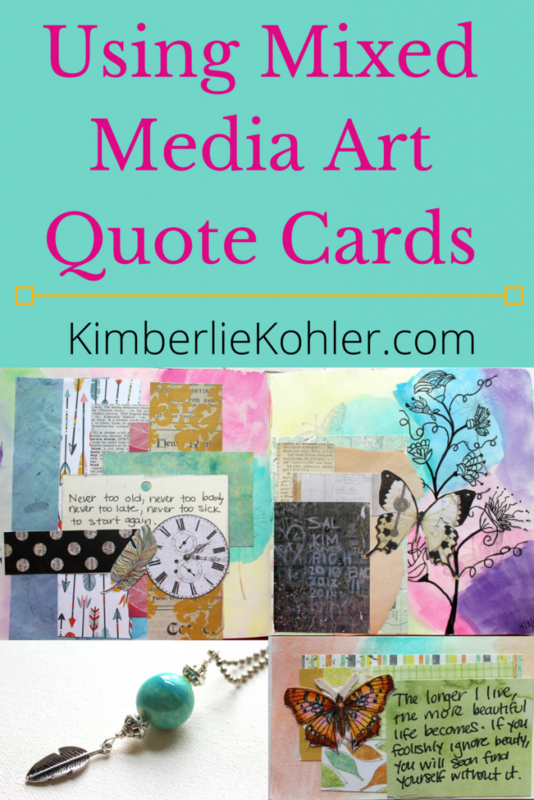 Last week, I showed you how to make these fun Mixed Media Quote Cards. Today I wanted to share how you can use them for inspiration – even for inspiration for your jewelry making! Use as a prompt in your art journal. I used the quote and then created an art journal layout with the quote in mind. Watercolor all over as the first, background layer. 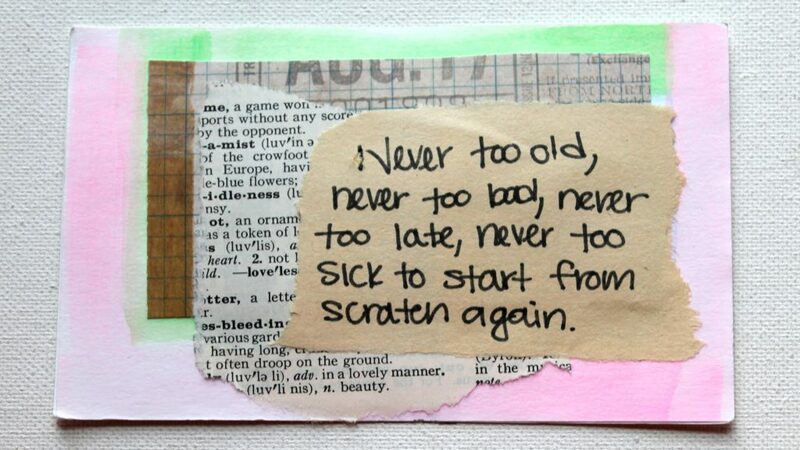 Then a collaged different ephemera – old text, map, scrapbook paper, a photo and wrote the quote on an old library card catalog card. Use as a writing prompt in your journal. Just write out all your thoughts and feelings about the quote. You could pull a card each day in the morning and just free write about it. I actually used the art journal page I created as inspiration for a jewelry piece, but you could use the Mixed Media Quote Card itself. This is something I go into in detail in my Jewelry Design Workshop, but in general look at your inspiration (the card or art journal page) and think about colors and themes and how you could translate that into a piece of jewelry. 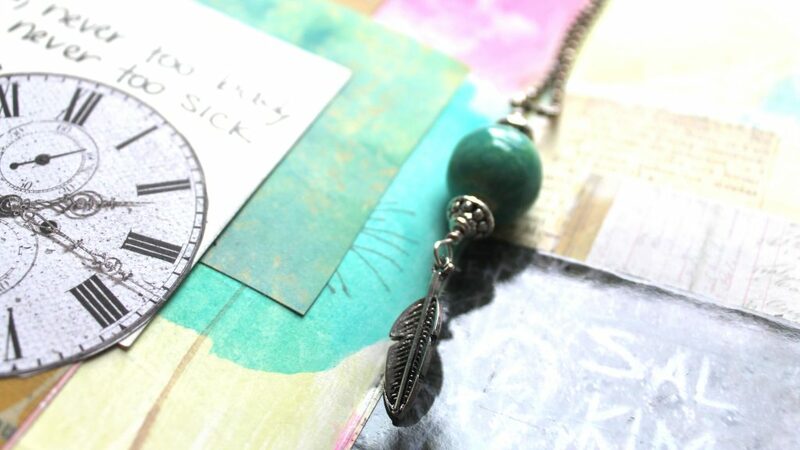 I pulled the turquoise color from the page, as well as the feather that was a theme in the art journal page. You could simply pull the card and think about it or even meditate on the quote. I hope you are inspired to use your quote cards! If you’re trying to find your own jewelry style or want to know how to translate your own inspiration into your jewelry pieces, my Jewelry Design Workshop is what you’re looking for! 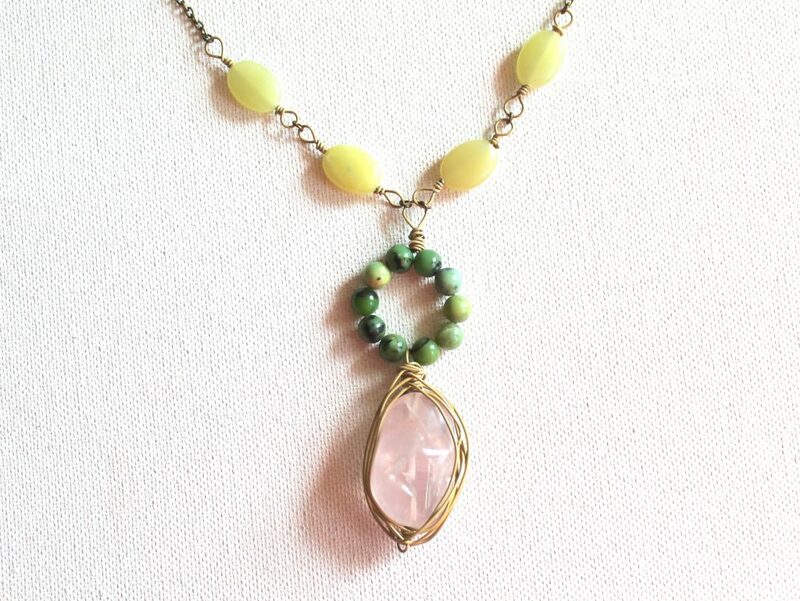 Have you been making jewelry, but following others’ tutorials and have a yearning to come up with your own unique designs? Have you seen other people’s designs, but they’re just not quite right for you and your own style? Wondering how you even figure out your own personal jewelry style? And how do you come up with ideas without having all day to dream about jewelry designs? Give me a few minutes a day and I will take you from wondering how jewelry designers come up with their ideas to designing your own jewelry in your own unique style! 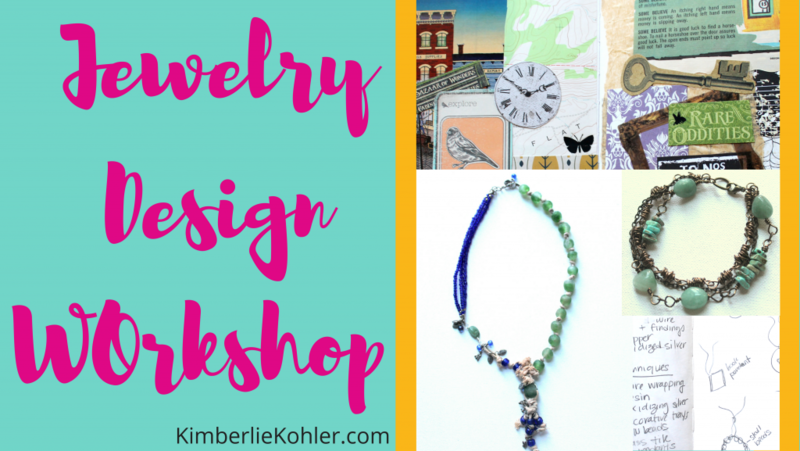 In my Jewelry Design Workshop you’ll learn my process for never running out of ideas for jewelry designs. Through the process, you’ll develop your own personal jewelry style and even learn how to put together a cohesive collection. We’ll start by learning about the basic principles of jewelry design. 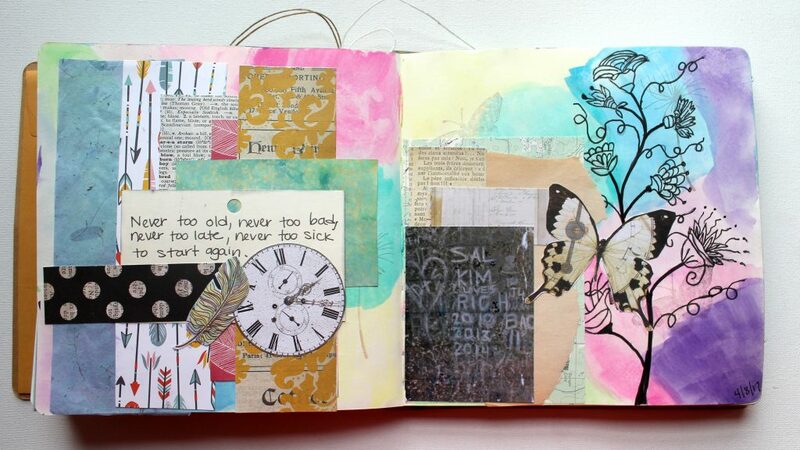 Then you’ll learn how to create an Idea Collage, a technique you can do over and over again to get lots of inspiration. Plus you’ll get some bonus prompts for even more inspiration. I’ll share my process for pulling ideas from your Idea Collage. Then we’ll move onto actually sketching our design ideas and choosing designs for a collection. 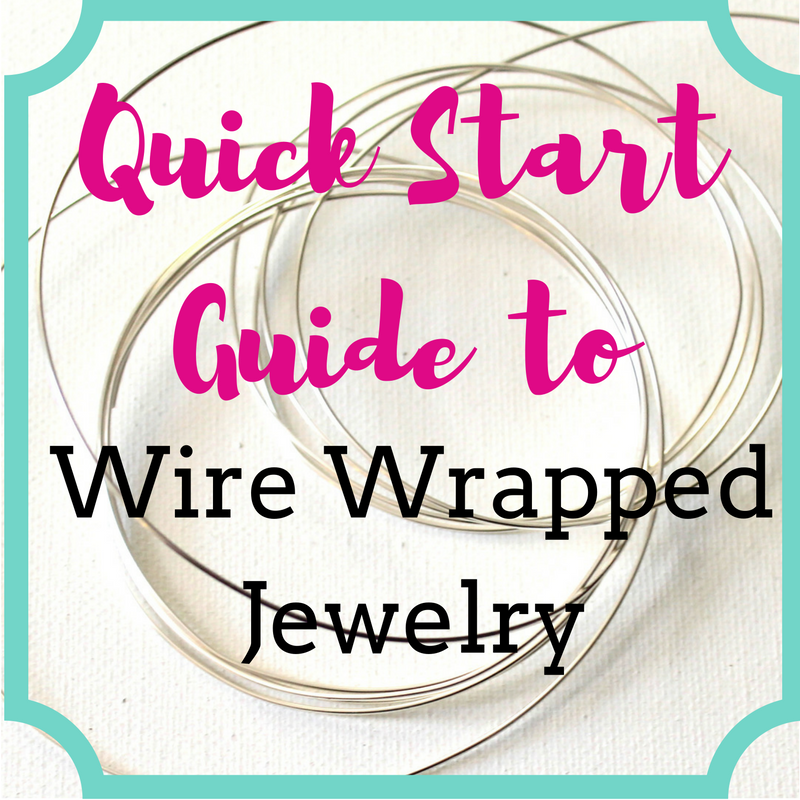 Finally, I’ll share tips for finalizing your jewelry designs and troubleshooting when a design does not seem to be quite working. A couple of days ago I shared my latest art journal page and shared about being inspired by materials. 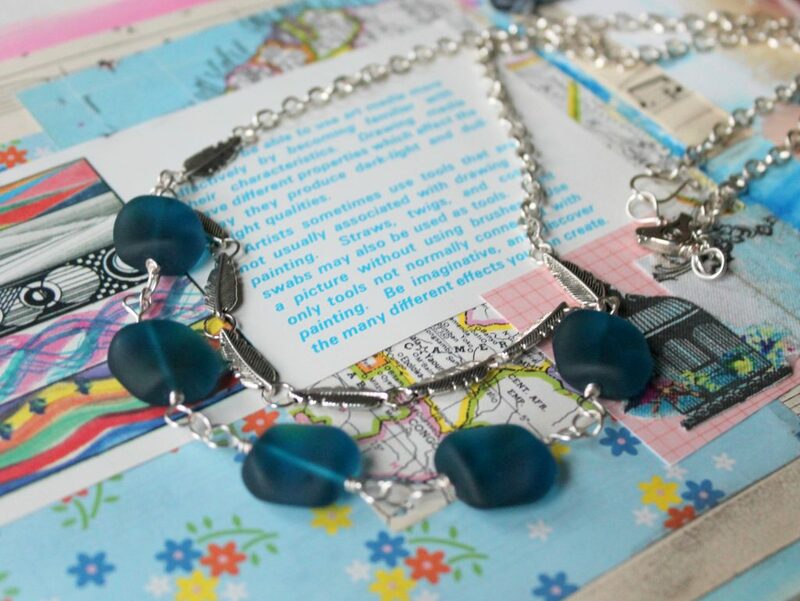 I studied the art journal page and just let all the colors and shapes sink in and this necklace came out. In Inspired eCourse, I show you a step-by-step process for taking inspiration from the art journal pages that we make from prompts in the eCourse. However, for this necklace I didn’t use that process specifically. I had every intention of using the process, but instead the idea came to me in a state of sleepiness. I saw the bottom part with the wires loosely wrapped around the stone. The rest of it came to me more on the spot as I pulled out materials and thought about what direction the necklace would take beyond that loosely wrapped stone. I used colors from the page, which is part of the process I teach in Inspired eCourse. 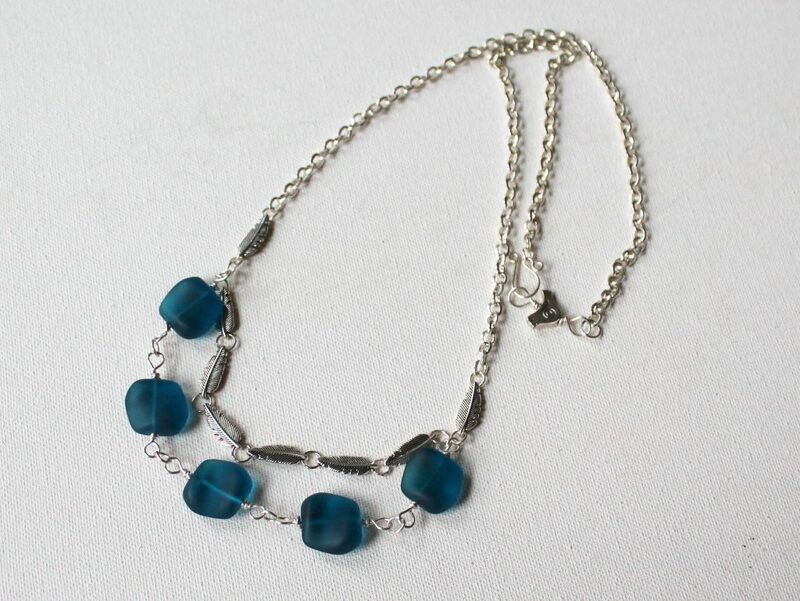 I’m pretty crazy about the color combination in the necklace. It’s something I would probably have not tried together had I not had a similar color combination in the art journal page. It’s interesting where inspiration can come from. 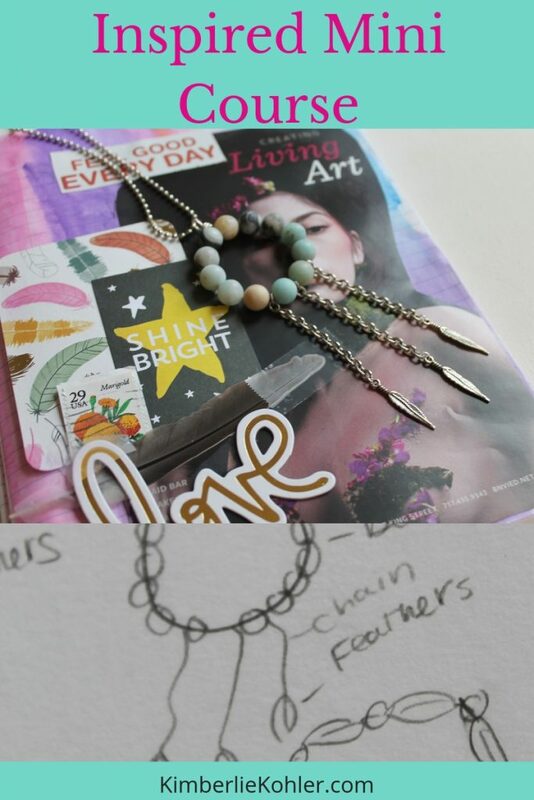 I made the art journal page (inspired by materials), then made the necklace (inspired by a sleepy idea and the art journal page) and now this necklace has inspired me to sketch out a bunch of other ideas..
Where your inspiration take you? 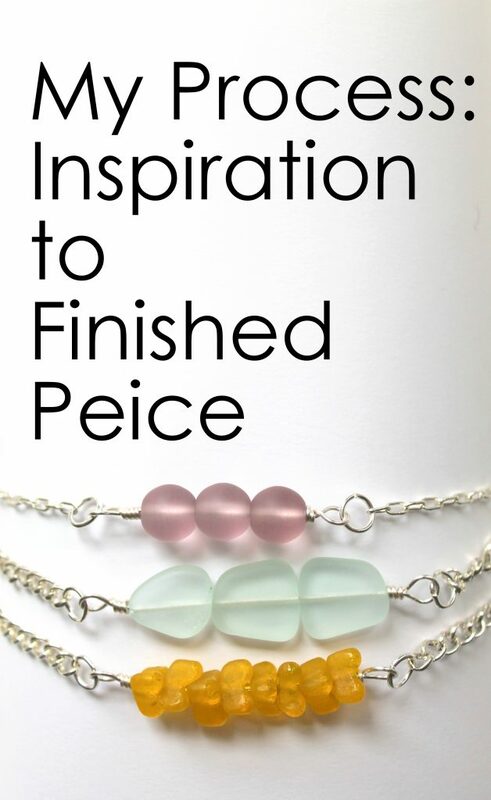 Need a little more inspiration for your jewelry designs? Check out my Inspired eCourse! The introduction is all about getting started art journaling and I also have some fun techniques for you. Then each week you’ll get a creativity activity and art journal prompt, create an art journal page and then I’ll show you a map to go from art journal page to inspired jewelry piece. You’ll be designing your own jewelry, but I also have a jewelry project each week to inspire you, give you techniques or you can make it if you’re feeling stuck. Learn more about Inspired eCourse here. Last week I shared my art journal pages so far in my new art journal this year. This page, “Soar,” is one of those pages. In that blogpost I also shared my layering technique for each of the pages and what materials I used to create each page. 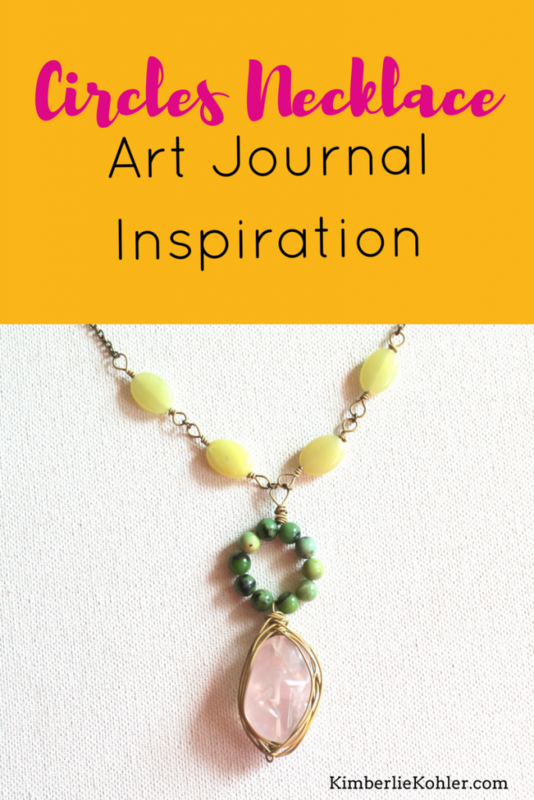 Today I wanted to share a jewelry piece that was inspired by that art journal page. I look at the page and look for themes, colors, shapes and textures that I can pull out of the page. Then I think of techniques I can use to translate those ideas into jewelry pieces. 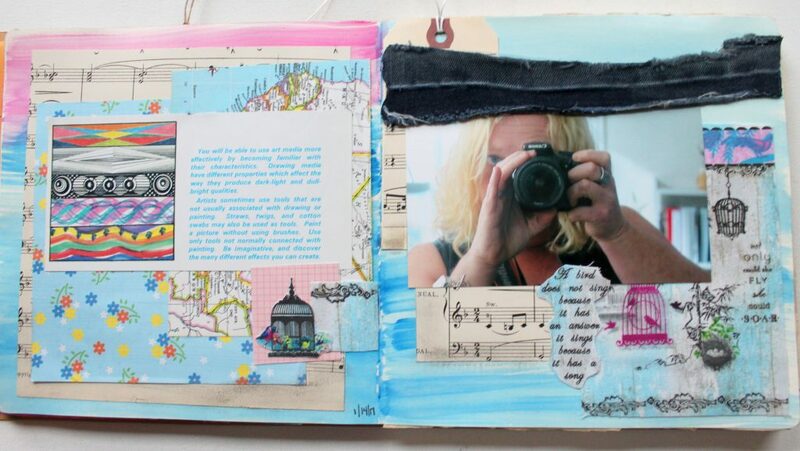 For this piece, I choose blue because it was very prominent in the art journal page. The quote that is the most important to me on the page is, “Not only could she fly, she could SOAR.” And the page has a lot of birds on the page as well. So I choose feathers as a symbol of flying – and soaring. I added a bird to the clasp that I made myself as well. 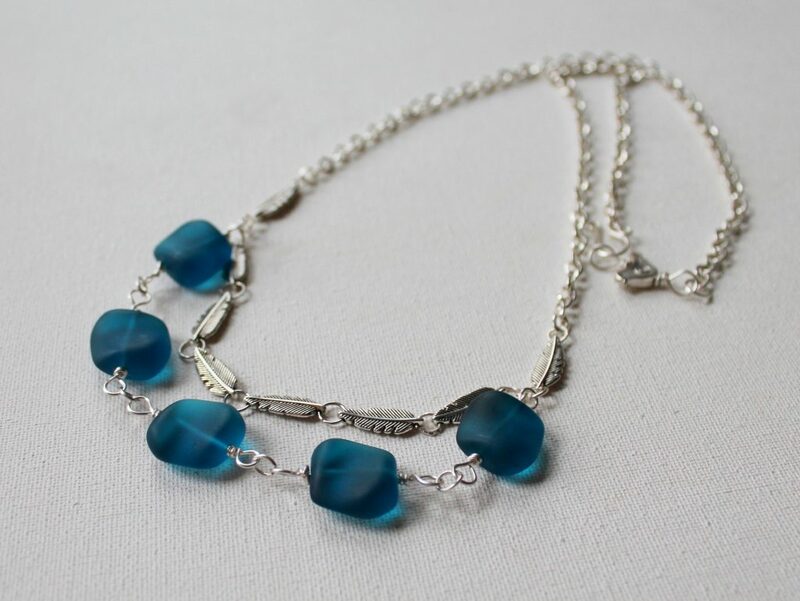 Recycled sea glass beads in a gorgeous blue color that I made into wire wrapped bead links and connected with jump rings. Jump rings that I made myself. Clasp that I made. 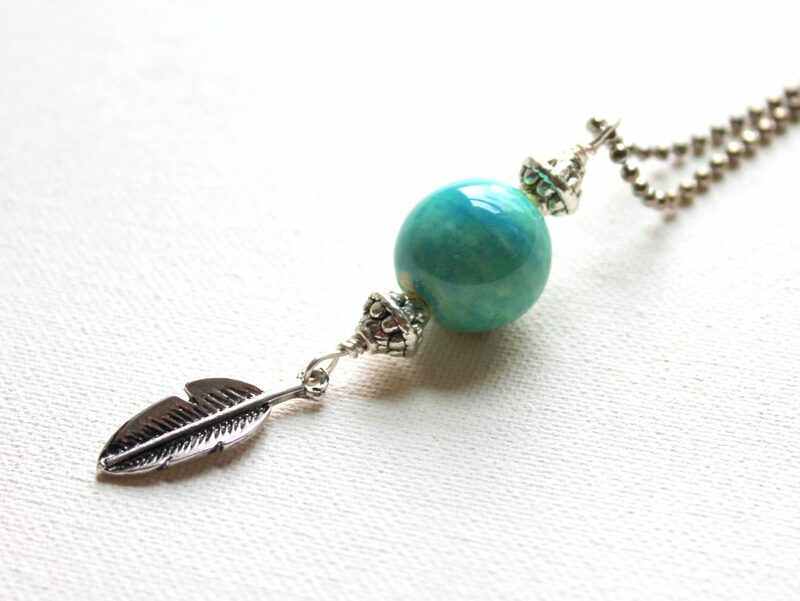 It’s a hook clasp and the other side is a wire wrapped bead link made with a little bird bead. 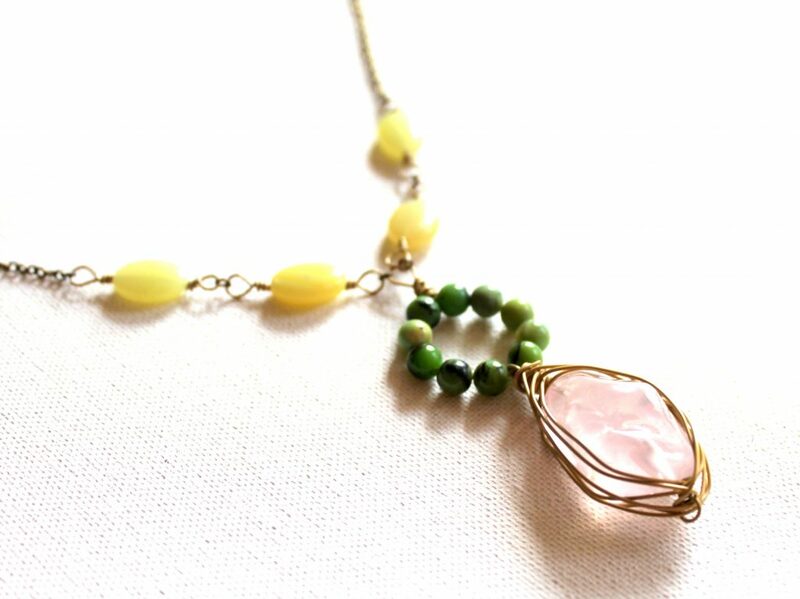 The result is this lovely necklace that isn’t just beautiful, but it’s really meaningful and inspiring to me. When I wear it I remember to not only fly, but to soar. 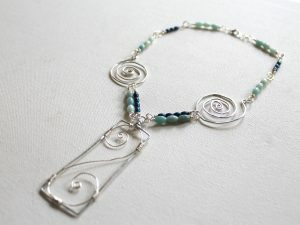 I often take inspiration from my art journal pages to create jewelry pieces. I love the process so much that I created an entire eCourse around it called Inspired eCourse. In Inspired eCourse, I give you creativity prompts and art journal prompts to create your own art journal pages and then take you step-by-step through the process of how to get inspiration from your art journal page and map out and sketch jewelry design ideas. In the class there is a jewelry project each week. Students typically create their own jewelry designs and complete them each week, but I provide the jewelry tutorial as inspiration and instruction for perhaps new techniques that you don’t already know or to give you ideas for your own piece. 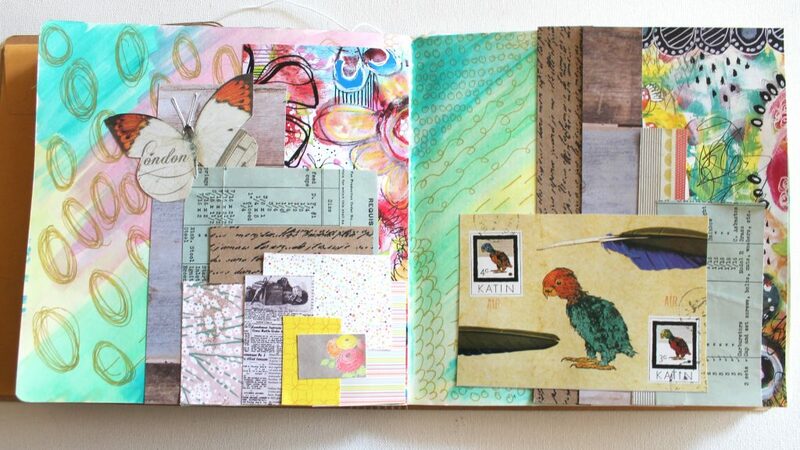 If you’re new to art journals, Inspired eCourse’s introduction is an introduction to art journaling. And even if you’re not new, you may learn some fun new ideas and techniques. After the intro there’s 4 weeks of class with each week having art journal and creativity prompts, creating art journal pages, pulling out inspiration from art journal pages and making jewelry. Learn more and sign up for inspired eCourse here: Inspired eCourse. I get asked about how I’m inspired to create jewelry pieces, so I made a video to show you! In this video I’ll show you how I went from inspiration to finished piece including a change I made along the way. For the step-by-step tutorial video on how to make the anklet, click here. We dig deeply into this process in my Inspired eCourse. 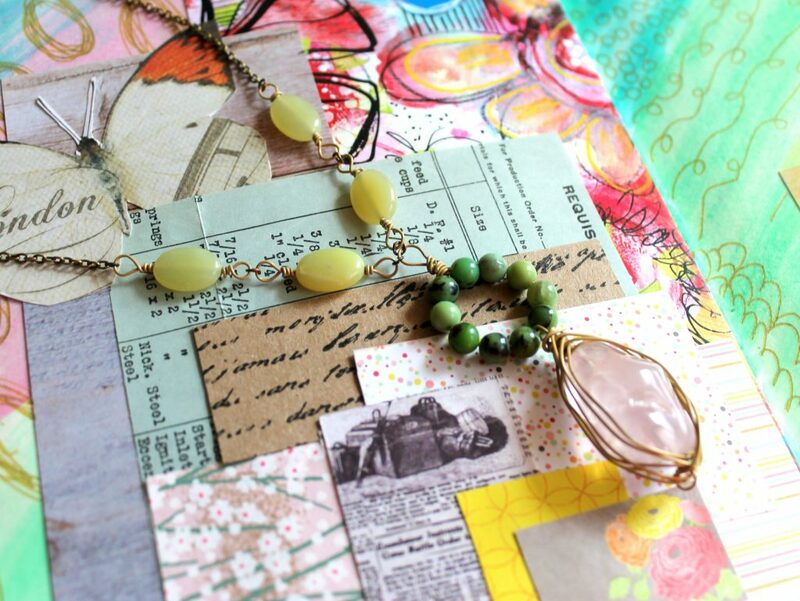 Inspired eCourse is an art journal/jewelry making class. First I give you creativity prompts and art journal prompts. 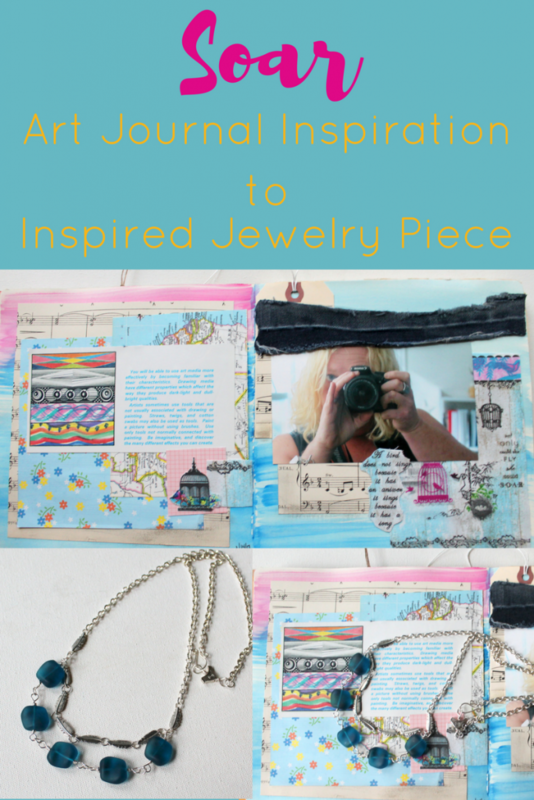 Then I show you how to take inspiration from your art journal pages to make a map to design jewelry pieces. Then I show you sketching designs. It’s full of fun and inspiration.